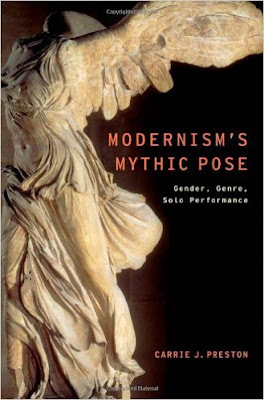 Carrie J.Preston, Modernism’s Mythic Pose –Gender, Genre, Solo Performance, Oxford, Oxford University Press, 2011. As I delved into Carrie Preston’s book, one iconic pop song refrain kept coming to my mind, “strike a pose” from Madonna’s Vogue. The song and the video both focus on posing and more specifically on vogueing, a dance style born in Harlem in the 1980s and characterized by sophisticated arm movements. Madonna inserted these moves in her video, stylishly choreographed by Karole Armitage, and vogueing became a world-famous phenomenon. Interestingly, the video opens with dancers clad in elegant clothes posing among paintings by Tamara de Lempicka and what looks like a classical marble statue. The word ‘pose’ today may recall the act of posing as for a portrait or a photograph (what is inherently implied in the “strike a pose” line, in that the flash of a camera is probably going to flash out) and also an artificial posture, something you construct maybe to impress somebody else (again the video is clear about this). These aspects may sound quite distant from Preston’s groundbreaking study, but they are not. They resemble its focus on the significance of body posture in the art world, in this case, the popular art world. At the centre of Preston's research is the mythic pose which is clearly defined (unfortunately only in the afterword) as “a bodily attitude imitating an ancient statue, a poetic pose that repositions a character from myth, or an interpretative paradigm posing myth in analogical relation to current life”. A remarkable example can be found in Emma Lyon Hamilton’s performances. In the 1780s and 1790s, she was a famous tourist attraction in the English embassy in Naples where she lived with her husband, Sir William Hamilton. In her attitudes, she wore long tunics and was usually barefoot, holding one pose for a while and then moving on to the next one. The mythical figures she interpreted spanned from Mary Magdalene to Medea and exemplified “the tension between motion and stasis, the illusion that she was frozen in motion, but at any moment, the statue might become a living woman again”. Lyon Hamilton was a precursor of that same statue posing which blossomed a century later. Between the 1880s and 1920s, in fact, the art of posing fervidly grew, contributing to feed the rise and growth of modernism. It did just not mean people assuming the posture of a classical statue but included a multifaceted set of expressive performances, like attitudes, dramatic monologues, and solo performances and encompassed numerous fields like literature and dance. Preston’s analysis of the dramatic monologue in the culture of recitation is quite rich and positions the mythic pose “in various modernist venues and their influence on other forms of poetry”. In this sense, the Poetry Bookshop, which was opened in 1913 in Bloomsbury, London, by Harol Monro, a member of the Poetry Society, advocated the practice of reading aloud and organized numerous events that contributed to influence the work of poets like T. S. Eliot and Amy Lowell. According to Lowell, poetry should be considered a “Spoken Art” where the aural quality of words are paid a special attention, “Lowell understood recitation as the most contemporary pursuit of poetry”. Where did all these genres linked to the mythic pose come from? Where did they originate? Lyon Hamilton was a renowned precursor, but François Delsarte was the pedagogue, theorist and actor who gave the phenomenon substance and meaning in the nineteenth century. He believed in approaching the body in relation to expression and developed a complex body topography “based on a series of trinities: three human ‘states’ (mind, life, and soul), ‘three organic apparatuses’ (thinking, loving, feeling), and three ‘languages’ (speech as language of the mind, song as the language of love and life, and gesture as the language of the soul)”. Delsarte’s writings did not survive him in a consistent manner, but his disciples widespread his findings both in Europe and in the United States. In the States, Isadora Duncan, the protagonist of a revolution in dance and culture, was highly influenced by his theories and her performances imbued with his approach. Preston devotes an entire chapter to Duncan and her “motor in the soul”, an image that recalls the Futurists’ celebration of the machine and that embodies her “attempt to make dance ‘new’ by turning back to a mythical past”. Preston’s analysis is beautifully weaved in that it presents Duncan in a fresh and layered light, by focusing on her dances, her approach to movement and her writings. With regards to her dances, their reconstructions deserved perhaps a more careful attention, as it is important to contextualise and give background to the dancers, teachers and choreographers who are carrying on her legacy: how was it done? How was her work reconstructed? What were its main problems? And so on. Preston concludes her analysis with another case study dedicated to H.D., poet, model, writer, and actor, showing how “an antimodern critique unites her work: the search for a mode of being that unites body and soul and the use of myth to encourage readers and audiences to participate in a similar search”. Preston explores H.D.’s poems, photographs, films and her study becomes particularly captivating when she talks about montage. H.D. worked on the editing of films like Borderline but montage also influenced her poetry. For example, her poem Trilogy “depicts dream-visions through montagelike juxtapositions of ritual traditions and modern events, including alchemy and the London blitz”. Preston's book is an outstanding achievement that purposefully moves between disciplines and across time to present a neglected picture of mythic posing and its multiple ramifications. Posing was a meaningful art and today's definition comes more alive thanks to this study because it gives it a fundamental background. Even Madonna's "strike a pose" can be seen from a richer perspective as a way to capture attention in liaison with a mythical past, in this case embodied by the celebrity figures mentioned in the song. The volume also deservedly won the 2011 de la Torre Bueno Prize, issued by the Society of Dance History Scholars.